Join us this Friday 10 am to 7:30 PM at In Your Wildest Dreams! 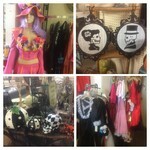 Get your Halloween shopping done early and save 25% on all Halloween costumes and accessories and fall decor. All Fall Boots, Scarves, Sweaters, Jackets and Juicy Couture Track Suits will also be 25% off! All Holiday Formal Attire and Jewelry in the whole store will be 40% off! Stop by for SWEET TREATS, a preview of our Halloween Costumes and great deals throughout the store. The IYWD team will be dressing up so stop by and say HI. Enter to win a $75 gift certificate to the store and a nice Fall Table arrangement!